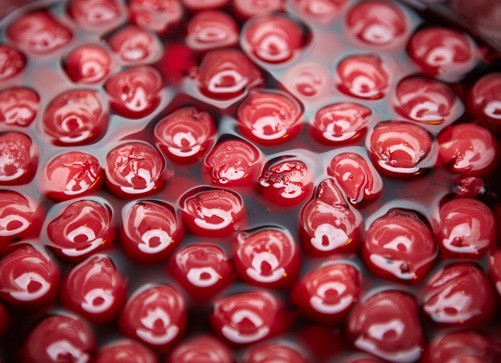 Quantity: For each 7-quart canner load, you need an average of 17-1/2 pounds of whole cherries. For each 9-pint canner load, you need an average of 11 pounds of whole cherries. A lug weighs 25 pounds and yields 8 quarts to 12 quarts — an average of 2-1/2 pounds per quart. Quality: Select bright, evenly colored cherries. Look for cherries that are at the ideal stage of maturity for eating fresh or cooking. 1. Stem and wash cherries. Remove pits if desired. If pitted, place cherries in a mixture of water and ascorbic acid to prevent stem-end darkening. 3. To can cherries with pits, prick skins on opposite sides with a clean needle to prevent splitting. 4. Use water, apple juice, white grape juice or syrup. In a large saucepan add water, juice or syrup (1/2 cup for each quart of drained fruit) and bring to boil. Fill jars with cherries and cooking liquid; leave 1/2-inch headspace. Add 1/2 cup hot water, juice or syrup to each jar. Fill jars with drained cherries; shake fruit down into jars gently as you fill. Add more hot liquid; leave 1/2-inch headspace. 6. Process in a boiling water canner according to the recommendations. Let cool, undisturbed, 12-24 hours and check for seals.